At Mercedes-Benz Financial Services, we recognize the importance art has in stimulating and enhancing our experiences in the spaces and communities in which we work and live. It provokes thought and inspires creativity. We are so pleased to continue our close partnerships with Southern Methodist University and Texas Christian University. The rich and diverse artwork we receive from their students and graduates, provides color and light to our work environment. Let the inspiration continue! We truly hope you can join us in viewing the newest exhibition and meeting this year’s featured artists. Beverages and hors d’oeuvres will be served. 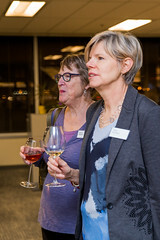 You and a guest are invited to attend the annual Mercedes-Benz Financial Services Experiencing Perspectives art reception in Fort Worth on Wednesday, November 8 from 6:00 to 8:30 p.m.
We are so pleased to continue our close partnerships with Southern Methodist University and Texas Christian University. The rich and diverse artwork we receive from their students and graduates, provides color and light to our MBFS work environment. Let the inspiration continue! We truly hope you can join us in viewing the exhibition and meeting the artists. Beverages and hors d’oeuvres will be served. You and your guests are invited to attend the annual Mercedes-Benz Financial Services Experiencing Perspectives art event. At Mercedes-Benz Financial Services, immense value is placed on the influence that art has in the workplace. 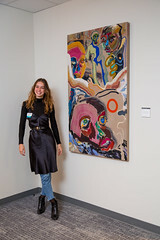 Thanks to special partnerships with Southern Methodist University and Texas Christian University, we are able to enhance our work environment with cutting-edge art from their students and graduates. Please join us to view the exhibition, meet the artists, and be inspired. Beverages and hors d’oeuvres will be served. 6:45 – 8 p.m. – Art, conversation, music, food and fun! At Mercedes-Benz Financial Services, immense value is placed on the influence that art has in the workplace. You and a guest are invited to attend the annual Mercedes-Benz Financial Services Experiencing Perspectives art reception. Thanks to special partnerships with Southern Methodist University and Texas Christian University, we are able to enhance the MBFS work environment with cutting-edge art from their students and graduates. Our first-annual Employee Art Exhibition will also be on display. View the exhibitions, make new connections and be inspired. Beverages and hors d’oeuvres will be served. Art is a signature element of the Mercedes-Benz Financial Services workplace. Please join us as we celebrate our sixth installation of the Experiencing Perspectives Art Exhibition, featuring thought-provoking creations from the students, graduates and faculty of SMU and TCU. Meet the artists. Tour the exhibition. Enjoy cuisine and conversation. Mercedes-Benz Financial Services is a company in the business of automotive finance. Our facilities are not galleries, but they display some of today’s most cutting-edge art. Our employees and visitors are inspired by various forms of art each day from students, faculty, and graduates of Southern Methodist University and Texas Christian University. Please join us for the celebration of our fifth annual art exhibition at Mercedes-Benz Financial Services. You and a guest are invited to view the exhibition, make new connections and be inspired. Beverages and hors d’oeuvres will be served. At Mercedes-Benz Financial Services, we believe art is a catalyst for establishing a dynamic, inquisitive and creative work culture. 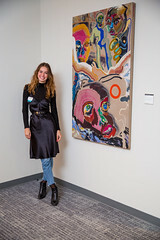 While our workplace might not be a gallery, it does display a diverse range of thought-provoking art from Southern Methodist University and Texas Christian University students, graduates and faculty. We invite you to celebrate the arts with us as we explore these works and their role in sparking innovation and change. Please join us at 6:00 p.m. for appetizers and drinks. The program will begin promptly at 6:45 p.m. If a picture can express 1,000 words, then we have a night of stimulating dialogue for you. At Mercedes-Benz Financial Services, we believe that art plays a critical role in creating a dynamic work environment, an inquisitive culture and sparks creativity. While our workplace might not be a gallery, it does house cutting-edge art from students, alumni, and faculty from SMU and TCU. To explore the art and the question of what role art can play in being a catalyst for change and inspiration, we invite you to join us for an evening celebrating the arts. Art tours will challenge your perspectives, live performances will leave you breathless and the serendipitous discussions with artists and guests are sure to be memorable. Please join us at 6:00 p.m. for appetizers and drinks as we experience perspectives from various cultural platforms.